Click to viewFollowing the new iMac, Apple's portable platform is probably next for a redesign, with 9to5mac pointing at the long-fabled ultra-slim MacBooks and now AppleInsider mumbling about the Son-of-Newton. 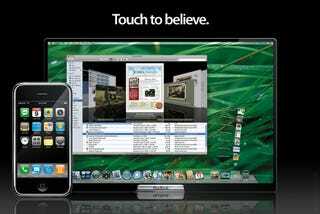 According to them, it will be a 720x480-screen PDA 1.5 times the size of the iPhone, running an embedded version of Mac OS X. With the PDA industry dying and Apple focusing on current product lines, does it make sense to release such a product? We think it doesn't. If anything, our guess is that Apple may choose to marry touch technology with down-to-Earth thinner notebooks for a better, far-reaching product: the MacBook touch. AppleInsider says that this reduced Newton-inspired slate computer/PDA/multimedia thingamabob exists, running a special version of Mac OS X. We believe that there may be such a product in the lab. But then they go as far as predicting a possible first-half-of-2008 launch and a MacWorld San Francisco keynote introduction, and here's where we have our doubts. There are many things against this idea. Opening a new market segment, one with little differentiation to the failing UMPCs is a very difficult proposition, even if Apple manages to reinvent these devices again successfully. The problem with UMPCs, however, is that it may never be a product for the masses, exactly like the Newton. It was too small for notebook replacement, too big for true portability. And if Apple has shown anything lately it's that their objective is the consumer market, either through music and telephony or through standard computer platforms. Looking at the market, it seems that while people may be willing to sacrifice things like a full keyboard in the name of portability, like the case of the iPhone or the iPod touch, this will never happen in the notebook or sub-notebook space. That's why Microsoft's partners and Jack Bauer opt for hybrid notebook-tablet formats. Although not a resounding success, this concept is starting to gain traction. It may be Apple's opportunity to re-invent the format and do a good implementation of such a compact device, now based in multi-touch technology. There's where the ultra-slim MacBook and the Son-of-Newton touch concept can make the difference. The Newton brand will probably never make a comeback, though, as the public identify it with total failure (egg freckles anyone?) and PDAs. Also, with Apple centering its development efforts around Mac OS X in almost every device they produce, the Newton OS technology won't see the light again in its previous form. If this rumor materializes in one form or another, most probably Apple will either create a new name or just capitalize in their current brands. For sure, a ultra-thin MacBook touch running Leopard on Intel's just announced ultra-low power Core processors, along with solid state storage and WiMax support, doesn't sound bad to me.